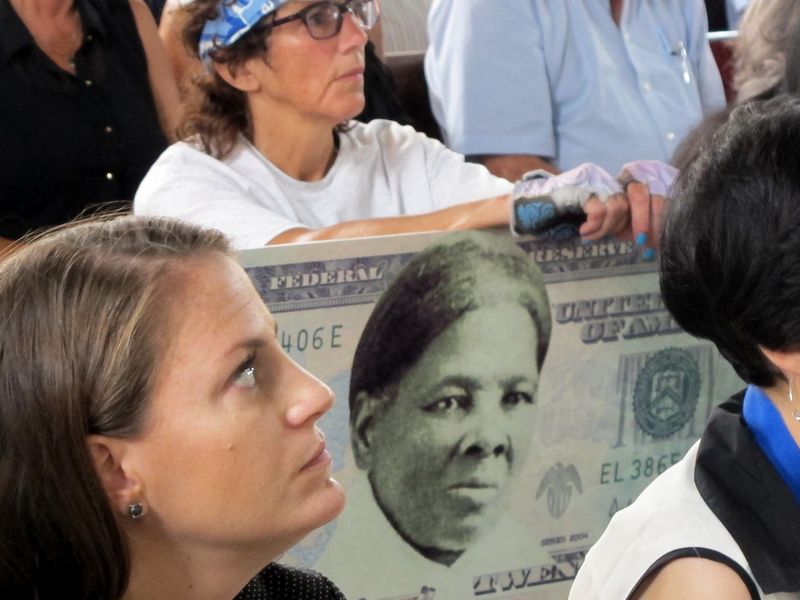 At a meeting for public input on proposed currency changes, a woman holds up a placard showing what a Harriet Tubman $20 bill might look like. The U.S. bank note that stocks the nation’s ATMs will soon be getting a makeover, and Harriet Tubman, one of American history’s great heroines, will front the bill. The famous Underground Railroad conductor, who has been called “the Moses of her people,” will be featured on the $20, to be unveiled by around 2020, in time for the centennial of the Nineteenth Amendment, which gave women in the United States the vote. Tubman (ca. 1820–1913) escaped from slavery in 1849 and then risked her life returning covertly to the South some 19 times to bring more than 300 other escaped slaves to safety in the North. She also served the Union cause during the Civil War as a nurse, a scout, and a spy. As U.S. currency continues to undergo an anti-counterfeiting redesign, the $10 and $5 bills will also get an upgrade. Before Treasury Secretary Jack Lew announced long-awaited changes to U.S. currency in April, controversy swirled around the possibility that Alexander Hamilton might be replaced on the $10 bill by a woman. Perhaps thanks to the hit Broadway musical Hamilton, the nation’s first secretary of the Treasury will live on as the face of the $10, which will also feature abolitionists and women’s rights activists Lucretia Mott, Sojourner Truth, Susan B. Anthony, Elizabeth Cady Stanton, and Alice Paul on the reverse side. The revised $5 bill will keep Abraham Lincoln on the front but will add new faces to its obverse side to highlight the history of the civil rights movement as celebrated at the Lincoln Memorial. Images of Martin Luther King Jr., who gave his “I Have a Dream” speech on the steps of the memorial, will be represented, along with singer Marian Anderson, who gave a path-blazing performance there in 1939, and Eleanor Roosevelt, the former first lady. Recaps the debate and decisions over how to incorporate a woman’s portrait onto U.S. currency. This Is Harriet Tubman, Who Will Appear on the $20 Bill. Accept No Substitutes. Highlights the “mystery” over which image of Harriet Tubman will grace the new $20. Points out the delays between when we will be able to see the new $20 and when we will be able to spend it. Learn about the movie starring Cicely Tyson based on Harriet Tubman’s life.